The 9th SOUND Economic History Workshop (21st-22nd May) is now over but has been an inspiring workshop with a wide range of interesting presentations. The workshop, which has been organized by Alfred Reckendrees and Jacob Weisdorf, took place in the modern facilities of Copenhagen Business School surrounded by the lovely parks and neighborhoods of central Copenhagen. 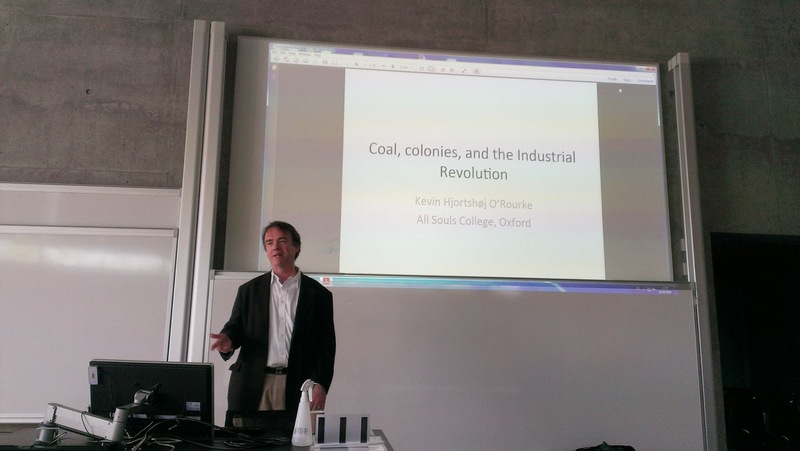 Kevin O’Rourke (All Souls College, University of Oxford) has initiated the workshop with his Wednesday keynote lecture named ‘Coal, colonies and the industrial revolution’ which addresses two largely debated topics of economic history, the role of coal and foreign trade during the industrial revolution. 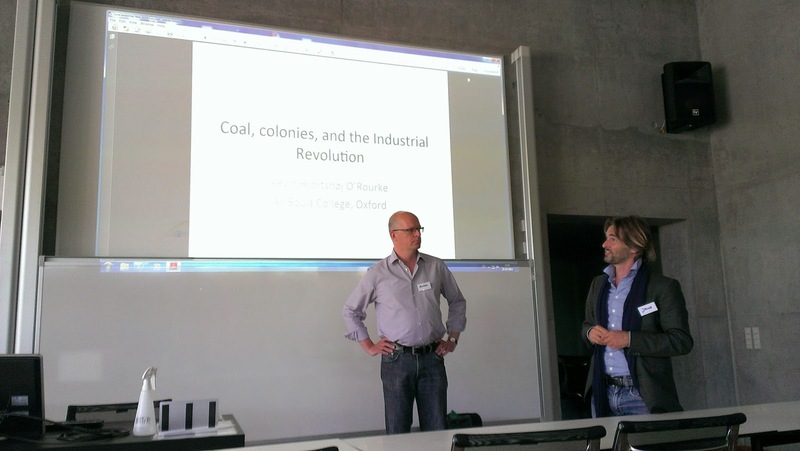 Kevin’s presentation provided an extensive discussion of the current debate on the role of coal in industrial development followed by quantitative evidence which showed a significant impact of coal location on urbanization in Europe. In the second part of his lecture, Kevin then focused on the British continent and the role of foreign trade during the 19th century industrialization. After the debate following Kevin’s speech, the participants could enjoy a nice lunch and walk in the nearby facilities of Copenhagen Business School. The afternoon session offered then a wide range of topics from economic history. 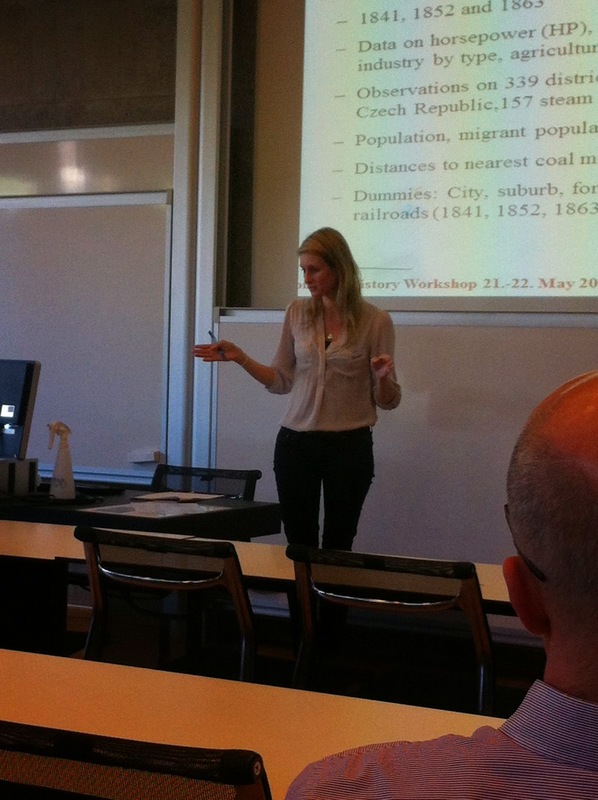 Hana Nielsen (Lund University) built on Kevin’s lecture and presented a country-specific study on the role of coal during the Czech industrialization by drawing on spatial analysis of coal and steam data. 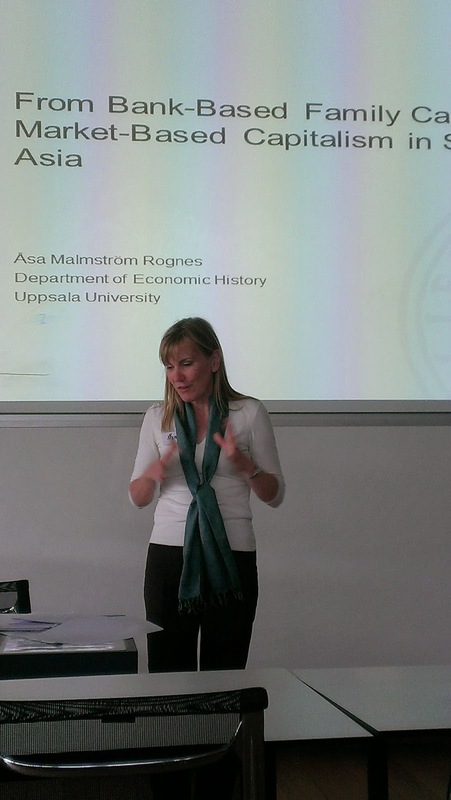 Åsa Malmström Rognes (Uppsala University) presented one of articles from her upcoming PhD dissertation focusing on family business groups in South-East Asia. In her presentation, Åsa discussed in more detail the role of capital markets for family business groups and how the Asian crisis changed them. Ursula Hård (Stockholm University) also presented a chapter from her coming PhD thesis which analyses the formal and informal institutional possibilities and obstacles that women business owners and entrepreneurs in rural communities face when they through investment in businesses within locally produced foods. After a coffee break, Jacob Weisdorf (South Danish University, Odense) presented results of his co-authored working paper (Jane Humphries, University of Oxford) with long-run series of wages of women in England (1260-1850) with a particular focus on the consequences of the Black Death on women’s wages and its implications for the formation of the European Marriage Pattern regime. Last presentation of the first day went then to Eric Bengtsson (University of Gothenburg) in which Eric has provided some comparative analysis of the distribution of income between capital and labor in Denmark and Norway stretching back to 1830 up until now. Following this inspirational day, the participants have then gathered together for an official conference dinner which took place in a close vicinity of Copenhagen Business School. The second and last day of the SOUND workshop was again initiated by an interesting lecture of keynote speaker, this time Marc Flandreau from the University of Geneva. Marc then gave an inspirational lecture on the rise of rating agencies in the US and provided also with a comparative perspective on the differences between the US and UK in particular. Thor Berger, another speaker from the Lund University, presented results of his joint working paper (with Kerstin Enflo, Lund University) on another classical topic of economic history – the impact of railroads on the regional growth. In the paper, the authors analyze and provide quantitative evidence on the short- and long-run impacts of railroad on city-growth in Sweden for the past 150 years. Karol Jan Borowiecki (South Danish University, Odense) presented his paper on the well-being and creativity of three famous composers and provided quantitative evidence on the existence of a causal impact of negative emotions on the composers’ creativity. Again, after a refreshing lunch at Copenhagen Business School, the participants gathered for the last session of the SOUND workshop which started with a presentation by Alfred Reckendrees (Copenhagen Business School). In his presentation, Alfred addressed the proposals of industrialist from the district of Aachen to introduce mandatory pension system and minimum wages in a search to prevent future labor conflicts. Kerstin Enflo (Lund University) presented a paper on business cycles in the Nordic countries (1834-1945), a joint work together with Mathias Morys (University of York) where the authors utilize new data sets in the frameworks of the Dynamic Factor Model to construct indices for four Scandinavian countries. Last speaker from Uppsala University, Henric Häggvist, closed up the session with an extraction from his PhD research which analyses development in trade tariffs in Sweden. In his presentation, Henric offered a comparative analysis of trade tariffs in the period of 1780-1830 for Sweden and Denmark. At the very end of the workshop, Alfred Reckendrees discussed some issues concerning the journal publishing, in particularly focusing on the ‘do’s and don’t’ of academic writing, which was very helpful for many of the workshop participants. The workshop was then officially concluded. Economics at Cardiff University . The most exciting course I have ever followed was Peter Lindert and Keith Trace’s final year undergraduate ‘Topics in Economic History’ (I am not certain now that this was the title). It still seems to me to have set out an agenda for many of the themes that are most worthwhile in economic history. Motivated by inspirational teaching, we began by getting our teeth into whether there was a fourteenth century Malthusian crisis and romped through time from there, touching on Hicks’ Theory of Economic History. We savoured the origins of sixteenth century inflation and surged onwards towards the then present day, with the triggers for the West German post war miracle and Japanese super growth in the nineteen sixties. You could not get more contemporary than this last because the course was taught at the end of the sixties! Apart from the Japanese, and the US (surely the Great Depression as seen by Friedman and Schwartz?) case studies, most of the subject matter was European. How could such a course be developed if there were suitable customers available today? With almost another half century of economic history behind us since this epochal pedagogic event there must be a wide range of candidate case studies. European de-colonisation is perhaps one. The Russian and/or East European transition is certainly ripe for the mature reflections of members of the European Historical Economics Society and therefore for lively undergraduate study. Globalisation and shifting centres of economic power have changed Europe’s position in the world. Europe in the last half century is much more likely to be an ‘effect’ than a ‘cause’ – as with OPEC and the oil crises of the 1970s or through the competitive effects of the economic rise of post Mao China. But the origins and consequences of the European common currency will surely provide many insights for the whole world. A drawback of such a course on the supply side is that it is unlikely to appeal to the specialised academic country expert. It is much more suitable for an ‘ ideas’ teacher, who in adjacent disciplines with the appropriate technique perhaps might be sought among economists. But would they be found? At the time I was being delighted by the Trace and Lindert course I suspected most of these economics practitioners of being analogous to the glass bead game players of Thomas Mann’s eponymous novel. Either that or they were simply fascinated with ‘intellectual rigour’, which smelled of Freud’s Theory of Money. From these economists’ point of view to teach such a course they would need to find out about history, but this was professionally unnecessary because they could deduce it (and the present) from first principles. If this is still the case (assuming it was ever) then there may be a gap on the supply side for such a course, always supposing that there is a demand. For the economic history entrepreneur the task is to create such a demand, as well. Blog post written by: James Foreman-Peck, Professor of Economics at Cardiff University where he does not teach economic history. The topic of this year’s summer school is Catching up or falling behind? Institutions, geography and economic development of Eastern Europe in the long-run. Comparative economic development is a dominant topic on the global research agenda and economic history has made important contributions to the debate over the drivers of long-run growth. Why some countries or regions are rich while others are poor is a question that has inspired both economists and historians for a long time. Institutions, geography and resource endowments have all been attributed important roles in the literature explaining diverging trends in the global economy over the last two centuries. Eastern Europe was heavily affected by the grand transformations of modern history. Old empires had fallen and new ones emerged, and in the twentieth century independent nation states were formed. Not only were the borders in Europe’s eastern periphery redrawn multiple times; formal institutions, the modes and structures of production have been transformed dramatically. Yet, Eastern European economists paid little attention to long-run development, and thus New Economic History that applies social science theory and quantitative analytical tools to studying the past could not make strong inroads into Eastern European scholarship. 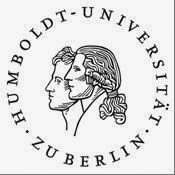 The Summer School, sponsored by the European Historical Economics Society, Humboldt University and the London School of Economics, is dedicated to reversing this trend by bringing together young scholars from different parts of Europe whose research focuses on the economic history of Central, East and South-East Europe (CESEE) or on comparative development across different European regions. How did you get interested in Economic history? My interest in History began relatively earlier, during the last years of the primary school. Later, when I was about 16 years old, I discovered economics by chance. I was enthusiastic about two TV series: "Free to Choose" of Milton Friedman and “The Age of Uncertainty” of John Kenneth Galbraith. During my bachelor in History, my favorite subject was, indeed, economic history. Then, it was obvious for me to try to pursue an academic career in the discipline. Could you describe your carrier briefly? I finished my bachelor in History and Geography in 1990 at the University of Barcelona. 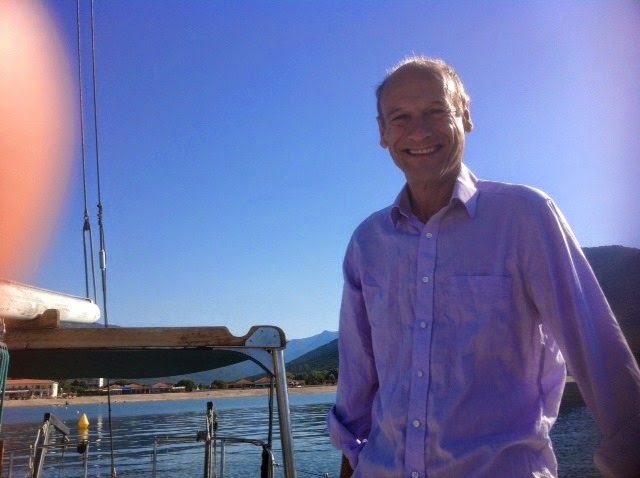 Then, I spent four years as assistant in the Department of Economics at Pompeu Fabra, Barcelona, while I studied a two-year master in Economic History at University of Barcelona. In 1995-96, I moved to the European University Institute, in Florence, where I finished my dissertation in 1998. 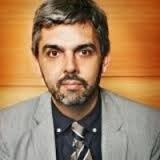 My supervisor was Jaime Reis. In the same 1998, I published my first article at EREH. After a short stage at UC Berkeley, I came back to Spain and get a post at Universidad Carlos III of Madrid. I was at Carlos III for about 15 years (until September 2013). Since then, I’m professor of Economic History at LSE. From mid-1990s, I published many articles in all major economic history journals. My research interest covers many topics but now I’m most interested in historical economic geography. Typically, I work with a myriad of co-authors and I’m engaged in several projects at the same time. In general, what do you look for in a submission and why? It is difficult to say because each submission is special and unique. Broadly speaking, a good submission in economic history should contain good ideas and substantial evidence. Economic history is an applied discipline and we need historical evidence to sustain our arguments. However, we cannot write economic history in isolation. We should know what other disciplines (particularly Economics and History) have already said about our research topic. We cannot accept ahistorical articles or research which ignores the basics of economics or statistics. How would you describe the perfect EREH article? This is certainly a harsh question and I haven’t the definitive answer. From the point of view of the Review, the perfect article is an article that gets many citations. Unfortunately, editors cannot predict ex-ante the amount of citations of any article. Then, the perfect article is an article that combines an original contribution with good scholarship. Typically, these articles open new avenues for research. What important changes do you see happening in Economic History research right now? How do you think this will influence future contributions in the journal? It seems that the Cliometric Revolution has been firmly established in the profession. Also, in the last five years, a new generation of economists seems increasingly interested in the field and economic history is expanding in many economics departments. Obviously, this opens a new window of opportunity for the profession but also represents a new challenge for us. We need to make the discipline more interdisciplinary and relevant. I expect that the field will interact, even more, with other fields particularly Development Economics and Economic Geography. If you ask me for the hot topics over the next years I expect to receive more submissions in Historical Economic Geography, inequality and financial-monetary history (particularly articles about crises and failed/successful monetary experiments). Another area which should expand rapidly is economic history of developing countries. We need urgently more research in Asia, Africa, South America and the Caribbean countries.